I was asked to give people a bit of a history of K9 Johnny and my fondest memories of him. I find this somewhat difficult to do just because there are so many fun memories of him. People with pets understand the pain that comes with losing that companion. Not to downplay that loss by any means, I must say losing a working dog brings that pain to a whole new level. You create such a bond, and such a partnership with these animals that it’s companionship like no other. You are with these animals 24 hours, 7 days a week, and spend more time with them than you will any human companion in your lifetime. So with that being said, it’s difficult to pick out just a few memories to share in regards to our experiences together. A little history: K9 Johnny was born in the Netherlands in May 2003. He was selected to be a working dog and shipped to the United States in November 2004. I was partnered with K9 Johnny in January 2005 at a training facility in northern Michigan. 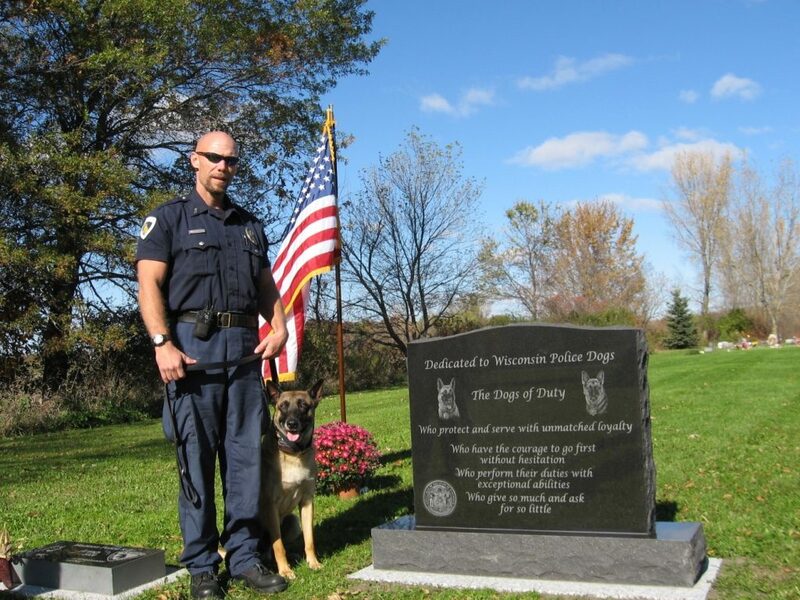 In February 2005, K9 Johnny and I begin working Patrol for the City of Madison Police Department. 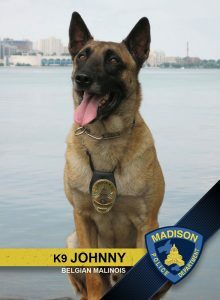 K9 Johnny was one of two canines assigned to MPD’s Patrol division. They were the first two canines on the department to be dedicated strictly to Patrol. When people ask my proudest moment with K9 Johnny, I would have to say it was within 2 weeks of beginning our careers together. Patrol had been sent to look for an elderly and endangered woman who had wandered away from a care facility. This was late February 2005. There was snow on the ground, temperature was quite cold as you can imagine, and this person had wandered away without the proper clothing. I was advised that she was last seen wearing only a pair of pajamas and some slippers. K9 Johnny and I checked in for our shift at approximately 12:15 p.m. this day. Immediately upon checking in, dispatch advised that north officers were currently looking for this woman that had wandered away. I was advised that she had been missing for approximately an hour and a half and that officers still had not found her. Dispatch requested that I respond to this area to see if K9 Johnny could assist in locating her. K9 Johnny and I immediately responded to the woman’s last known location. I presented K9 Johnny with a scent from the woman’s pillow case and gave him a command to track. K9 Johnny tracked approximately two blocks where we found the woman wandering on a side street somewhat dazed and confused. She was not dressed for the elements and you could see signs of hypothermia setting in. This was Patrol’s first experience working with a K9 in a patrol-type setting. Needless to say, patrol officers were quite impressed with K9 Johnny’s accomplishments, and from that point on our K9 Unit obtained some credibility. I have many other fun memories of K9 Johnny. Way too many, and some, too personal to share. I can say that he was a great ambassador for the Madison Police Department. And for the longest time, he was the face of our K9 Unit. Because of the shift we worked we were exposed to a lot of public demonstrations along with media publications, and K9 Johnny became well-known throughout the community. But not only was K9 Johnny a great community ambassador, he was also a loving family member at home. He was a great companion to our family and is still greatly missed. He adapted well to home life and became a valued part of our family. He loved playing with not only my kids, but the other kids in the neighborhood. He loved it when all the kids would come over to play with him. Among my happy memories of him were knowing that the entire neighborhood saw him as a loving family pet and not a menacing police dog. K9 Johnny passed away in June of 2016. He will always be remembered by me and my family as a family member that dedicated his life to keeping us and the community he served safe! Johnny was a Belgian Malinois named after Johnny Danger of the WJJO-Madison morning radio show. He was sponsored by Mid-West Family Broadcasting. He retired from service in February 2015.